Apple's share of the worldwide tablet market slipped to its lowest point ever in the third quarter of 2013, falling off 11 percent from the same time one year ago, while No. 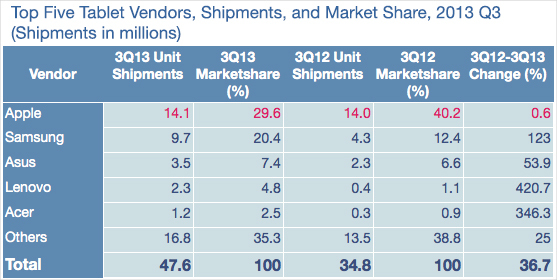 2 Samsung more than doubled shipments of its Android-based offerings. According to the latest data from research firm IDC, Apple shipped 14.1 million iPads in the third quarter of 2013, a 500,000 unit sequential decline from quarter two, while rival Samsung took second place with shipments of 9.7 million Android devices. The firm attributes Apple's stagnating growth to a lack of new models in the second and third quarters. Year over year, Apple's marketshare drooped 11 percent to 29.6 percent, with growth at 0.6 percent over the same period. Apple shifted its iPad launch schedule last year when it introduced the first-generation iPad mini and fourth-generation iPad in October. Apple will likely see a strong rebound with the all-new iPad mini with Retina display both launching in November, the research company said. IDC research analyst Jitesh Ubrani notes Apple's latest iPad Air and iPad mini with Retina display should appeal to a wider audience, though pricing may be an issue. "While some undoubtedly hoped for more aggressive pricing from Apple, the current prices clearly reflect Apple's ongoing strategy to maintain its premium status," Ubrani said. "It's worth noting that Apple wasn't the only one to increase the price of its small-sized tablet during this product cycle: Both Google and Amazon increased the price of their newest 7-inch tablets from $199 to $229 to cover the higher costs associated with high resolution screens and better processors." Samsung vaulted from a 12.4 percent marketshare to 20.4 percent on shipments of 9.7 million units in the third quarter, a gain of 123 percent. Number three Asus also grew its share with shipments of 3.5 million, up 53.9 percent from last year. The September quarter's biggest mover was fourth place Lenovo, which exhibited 420.7 percent year-over-year growth, jumping from a 1.1 percent share to 4.8 percent. The company shipped a total of 2.3 million tablets. Rounding out the top five is Acer, which managed to ship 1.2 million units to take 2.5 percent of the market, up 346.3 percent from 2012.